New technologies are now available to help reduce fat and eliminate cellulite. We offer many options depending upon the desire to sculpt your body to enhance your look and shape. These treatments help you look and feel your best. Treatments include: Vacuum Lipo Roller, Cellulite Reduction, Cryotherapy Vacuum, and Muscle Stimulating Slimming. Slimming Body Wrap utilizes infrared ray FiR technology to achieve a dry sauna slimming weight loss therapy. This thermal sauna beauty treatment is very popular and effective in weight loss, fat burning and body slimming. The infrared body sauna treatment is perfect for cellulite zones and is used for lymphatic drainage, improving metabolism and aids in burning fat to achieve weight loss. This procedure helps to remove toxins from the body and continual therapy will help to improve immunity. Treat stubborn cellulite and wrinkles. As you get older, your body starts to produce less collagen and store fat–this eventually leads to cellulite, wrinkles, sagging skin, and other signs of aging. 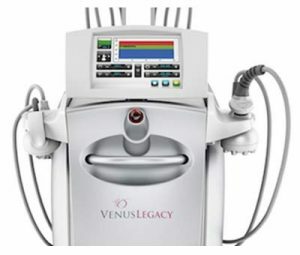 Venus Legacy uses heat to naturally boost collagen production and break down fat cells, which smoothens out cellulite and wrinkles. – Most patients receive 6-8 treatments per area, with each session lasting around 30 minutes. Treatments are done once a week. Consult your certified provider to determine the right treatment plan for you. The treatment uses. radio frequency technology, which is proven to be safe and effective for all skin tones. Enjoy a relaxing, comfortable treatment with no downtime that produces effective results. (MP) is the synergistic combination of MULTI-Polar RF and PEMF. The Multi-Polar RF and smart electrode coupling algorithm, deliver fast, homogeneous heating to multiple tissue depths. VariPulse is an adjustable pulsed suction that stimulates lymphatic drainage, increases blood circulation, and enhances the lipolysis effects of RF energy through cellulite reduction and body contouring. Lipo Cellulite Vacuum Roller can promote the production of collagen and elastin, release toxins and excess water retention and help to fade away scars, stretch marks and orange peel. It uses motorized massage tools to target fat, cellulite and uneven skin, shapes to balance out the skin. As the fat cells rebuild, they are redistributed throughout the body, creating an improved contour and shape. Lipo Cellulite Vacuum Rolling redistributes the fat deposit only but never removes it from the body. This RF body treatment probe produces converting Radio Frequency that penetrates cellulite tissue and generates “friction heat.” In addition to dissolving fat, the treatment will improve metabolism and stimulate lymph drainage. This is a smaller vacuum probe. Its size is suitable for vacuum shaping massage, performed on the face and neck. It is effective in reshaping the contour line of the face and tightening sagging skin on the neck. One of the latest developments in the treatment of cellulite is ultrasound cavitation. Extremely effective, it can reduce cellulite and fat on the body. ... This technique is effective in removing fat and reducing cellulite. It has also been used to tighten the skin and improve body physique. The Vacuum Lipo Roller is used to promote fat deposit redistribution so that the cellulite tissue can be neat, toned, smoother, and taut. This action can also help with the fat cleared by lymphatic drainage. After the vacuum shaping, it is recommended to use the multipolar radio frequency to dissolve fat and tighten skin. For the face, the Facial Vacuum Probe is used to smooth and tone, followed by the RF to lift face and tighten the skin. The muscle stimulation slimming machine is used to reduce fat and lose weight. It uses microcurrent electricity to stimulate muscle contractions passively. This effect will make the muscles exercise even if you are just sitting still. The Muscle Stimulating Slimming microcurrent helps to burn calories and burn fat. By building up muscle, fat is reduced and the body is toned. Studies have shown that the more muscle you have, the more calories you burn. Improving muscle will improve fat loss.